What is the matter with Canada, eh? 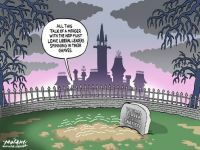 According to Slate magazine (http://www.slate.com/id/2199929/), and albeit left-leaning American publication, our inability to deal with minority governments, the collapse of the juggernaut of a political machine known as the Liberal Party of Canada, and several of Harper's Conservative policies are all problematic. It comes as no surprise to learn that the international community is less than pleased with Canada's formal 180 on the environment (even if the Liberals were good at talking about all things environmental and terrible at actually doing them). What I find particularly interesting about this article (or particularly concerning, depending on how normative one chooses to phrase this), is how our vote choice and election outcomes can change how the international community views us. I, for one, thought that few inside or outside Canada would notice the policy change enabling the federal government to leave Canadians languishing on death row instead of seeking to have their sentences commuted to life in prison with little to no chance of parole. Apparently, Americans noticed and some of them are rather unimpressed. It's nice to see others internationally also think the proposal to eliminate the tax credit to film and television production if the Minister in charge seems to dislike a title or some content is silly. I can't decide if it's fantastic or alarming that the Organisation for Economic Cooperation and Development (OECD) is concerned that Canada will start running deficits due to a "reckless cut to the national sales tax" (sales taxes are, after all, the only kind the Americans seem to be OK with as most municipalities/cities are able to levy their own). But the bottom line is that, as boring as we Canadians might find out politics, there are international types watching what we do. Like what Slate has to say or not, it's worth knowing that Canadian politics matters for more than just us.